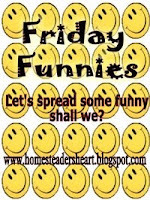 My friend Kim has Friday Funnies at her place - go get your laughs for the day! 6 Taking a car trip without trying to beat your best time. Sounds about right to me! :) Have a wonderful, blessed day! I love those. But I'm probably a bit guilty of number 6. I'm always looking for the fastest way to get somewhere lol. What a great list! I love the one about the bathroom scale! Have a great weekend! i found you thru joanne! and this was a funny post. what is it about men and racing? if its not to beat their own time, its always someone ahead of them that they need to beat! I love them! Great list! Just stopping by via the Friday Funnies! Beautiful blog home you have here! Oh those were good. I'm sorry I am late, I am not feeling well, I have been puny for about three or four days. I don't know if I am coming down with something or if I have allergies. But I have a horrible sore throat and can not sleep good at all so then I am tired all the next day. Not that you need to know all of this, but I am sorry I have not been faithful to your blog the last few days. I really am sorry!